Simple Solutions BONUS: Stepping into the life you REALLY want! Are you still hesitating to get started? I have a feeling I know what you are thinking, manifesting? Yep, it’s true! The oils can tap into, and release, deep-seated beliefs, and help you tap into your confidence, courage and Higher Self so you can reach for the life you really want to live. Feeling like it is time to step out of your comfort zone? Take a chance? Let the oils lead the way for you! Highest Potential Essential Oil Blend: This is an awesome oil! It is my favorite and is always with me. I have committed to using it daily for 30 days twice. Amazing things always happen in my life when I do! The oil is an exotic blend designed to increase your capacity to achieve your highest potential. It combines the uplifting and inspirational qualities of Australian Blue with the power of Gathering to help bring greater unity of purpose. Jasmine is added to enhance self-confidence, while Ylang Ylang calms, soothes and harmonizes. Northern Lights Black Spruce Essential Oil: Black Spruce is currently my favorite oil! It is grown on Young Living’s newest farm: Northern Lights in northern Canada. Grown in the tundra, the plant’s roots must grow very deep to reach nutrients and water. At the same time, there is a single sprig that grows up, absorbing the amazing energy of the northern lights. The oil from this plant was used by natives to help them tap into their spiritual nature, staying grounded as they reached for their dreams. Believe Essential Oil Blend: The combination in this blend may help assist as you move to a higher level of awareness. As you are able to move past emotional setbacks and barriers, you may be able to reach your true, unlimited potential. Primary Benefits: Encourages clarity and enlightening thoughts, brings a sense of peace and awareness and is spiritually grounding, promotes relaxation and confidence. Magnify Your Purpose: Magnify Your Purpose™ is a specially crafted blend of essential oils that stimulates creativity, desire, focus and motivation. It helps foster a positive attitude, encouraging you to rise above adversity, seize the initiative, overcome procrastination and self-pity, and magnify your life’s purpose. 2-3 drops Whatever oils you want! Add all ingredients to your roll on container. Label it with what you are trying to achieve. Voila! 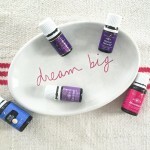 Your manifesting oil!